Note: For information about Lincoln's battle with Dutch elm disease, scroll down the page to "Inside City Hall Today." 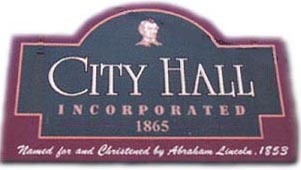 A summary of the history of city government in Lincoln, Illinois, is Chapter 5: "Government" in Paul Gleason's Lincoln: A Pictorial History (pp. 90-93). The material emphasizes the administrations of mayors from the 1860s to the 1940s. Local politicians in photos of those pages include Robert Madigan, William Randolph, Joe Sapp (the latter two in Alvey's Drugstore conferring with Homer Alvey), and Judy Morrow. On the homepage, I write that Lincoln, Illinois, may be seen from different angles. The first two sections of this page show different perspectives on City Hall and are titled On Top of City Hall Yesterday and Inside City Hall Today. The first perspective concerns the unusual landmark of the telephone booth on top of City Hall. This phone booth was installed, I would guess, some time in the late 1950s or early 1960s by the Civil Defense folks to allow patriotic citizens to scrutinize the horizon for tornadoes and Russian MIGS. The phone booth is clearly visible in 24.3 above (wind from the west) and 24.4 below (wind from the east). Fortunately, one of the participating patriotic citizens is a contributor to this Web site project and offers his memory of the rigorous Civil Air Patrol activities that his friends and he experienced. In February of 2003, Fred Blanford emailed his short series on present-day homeland security to 160+ alums of Lincoln Community High School. The above photo was included. "Earlier this year when I received a package of negatives from Mike Hamilton [LCHS, Class of 1958] -- a few stirred some memories that gave rise to what I thought to be a possibly humorous series I could send out. I worried, however, that some might mistake my intent in these tense times in which we live. I will preface this all with the statements: In the '60's I was inducted into the military service, served the prescribed time and when Honorably discharged -- even received a couple of "atta boys" for the record. Any ambivalence I had at the time had more to do with the way the campaign was being conducted than with the necessity for it -- leaving the decision as to the wisdom of the campaign to those with greater knowledge than I. At this time I am again ambivalent but the necessity seems considerably more apparent. With this series of notes + pics -- I do not intend to make a political statement -- only tweak you all to remember what were obviously "better times." My initial hesitance was finally overcome when I read yesterday's newspapers. In our youth (the '50's) part of Homeland Security was in learning the RULE--Duck and Cover. This RULE -- with all of the modern hi-tech science improvements that have been added since then IS NOW -- Duct and Cover with Visqueen. With the old rule -- no special equipment was required -- you had everything necessary with you. With the new rule, everyone needs to go to the local purveyors (a boost to the sagging economy no doubt) and purchase the materials necessary. The local merchants here were caught off-guard and thus do not have "emergency packets" made up -- so you must be ready to determine: 1) what grade duct tape you require -- home; utility; contractor's; or industrial and 2) which model visqueen you require -- will the simple "damp protection membrane" be sufficient or should you use the gas barrier or radon barrier models? I think I may (without further instruction) opt for the Zedex Hi-performance or Zedex Housing Grade -- believing you still "get what you pay for" in home protection. Civil Defense. Most everyone will remember the yellow and black stickers that advised of a building's suitability for "shelter" purposes -- they had been "hardened" (like the concrete-blocked the basement windows of the courthouse) and provisioned with "emergency supplies." The Eisenhower Interstate System incorporated the concept of making portions of the nationwide highway system suitable for emergency aircraft landings -- or so I have been told. One initiative in which I participated was the Civil Air Patrol, which involved volunteers spending time on the roof of City Hall watching for airplanes -- and when one was spotted (with the use of government developed books with silhouettes at various altitudes) calling to an office (told it was in Springfield -- long distance before any of the current unlimited time/distance stuff) and reporting the kind, altitude and heading of each airplane spotted. This was considered a part of "Civil Defense" and the scout troop where I participated, encouraged us to participate in the program. Mike Hamilton was also one of the participants. 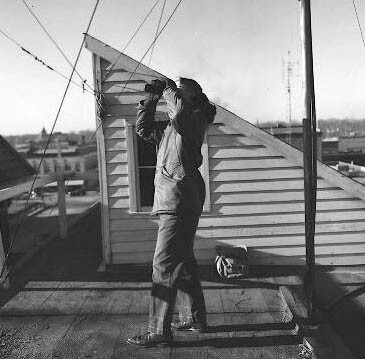 If I am not mistaken -- the attached pic is of Hank Spellman scouring the skies for "suspect aircraft." In all of the time I participated -- we didn't have a phone booth. The phone was located on a shelf inside the door to the stairway by which we accessed the roof. This was not just a summer activity. Note the character of Hank's coat. It got pretty cold up there some days. You may also note his "supplies" bag against the wall. This could include snacks and a thermos. Of course, our participation did come in for some criticism when one summer day we "bracketed" the wrong car stopped at the stoplight below -- with water-filled balloons. Hey -- the frontline troops in Homeland Security need a little R&R every now and again too." --Fred Blanford (1941--2008), LCHS Class of 1959. "The Lincoln City Government has sought to maintain the high quality of life which residents have become accustomed to through cooperation with local organizations, 'chamber of Commerce, Main Street, Logan County Government, businesses and prudent financial and development decisions. Lincoln has an alderman/ward type of government with a mayor-council system. The daily operations of the various municipal offices and department, includes Street and Alleys, Wastewater Treatment, Engineering, Building and Safety, Police and Fire Departments" (Chamber of Commerce brochure, p. 1). The photos above are from lincolndailynews.com.. 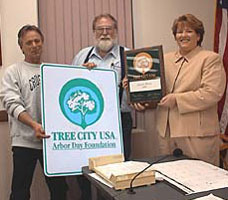 The caption of 24.7 reads "Donnie Osborne, Lincoln’s street superintendent (left), and Alderman Dave Armbrust, chairman of the forestry committee, present to Mayor Beth Davis an official sign and a plaque naming Lincoln a certified Tree City USA." [Photo by Joan Crabb]. Note: Mr. Armbrust is a distinguished member of the LCHS Noble Class of 1960 and a contributor of numerous vintage business ads and picture postcards that appear in this online community history Web site. Many of them are available at http://findinglincolnillinois.com/davearmbrust.html. Some historical background for the Arbor Day Foundation Award helps to show its significance. 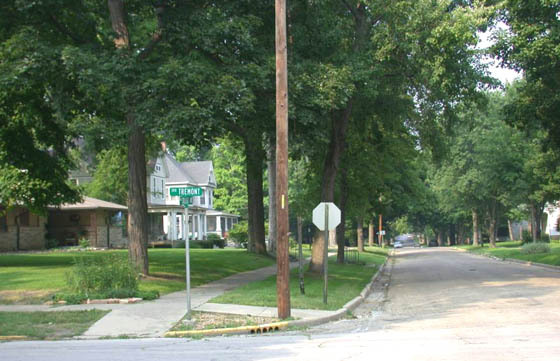 Late in the 19th and early 20th Centuries, Lincoln, Illinois, gained a reputation as being a city of magnificent shade trees (several places in this Web site mention references to this distinction in the writings of William Maxwell). 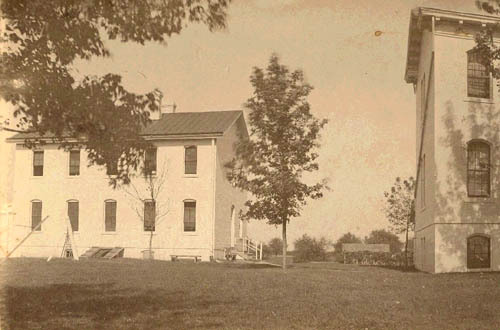 Many lawns and houses in Lincoln were shaded by elm trees, which lined nearly every street. Nancy Lawrence Gehlbach reports that as early as 1913, Lincoln, Illinois, had been nicknamed "The Forest City of Illinois. Her article titled "Pity Our Beautiful Trees" in Our Times, vol. 7, issue 1, spring 2002, pp. 8-9, is the most complete account of the elm trees of Lincoln and the Dutch elm disease that killed them. The plight of dead elms created two problems: the need for removal and the need for replacing with some hardier species of shade trees. Ms Gehlbach's article says that 1946 and 1947 saw about three dozen dead elms trees removed each year from city property. "In April of 1949 -- with an estimated 400 dead elms on city property and hundreds more on private lots -- Lincoln citizens passed a forestry tax of .05 per cent so the city could remove dead trees and spray uninfected tress with DDT" (p. 8). Treatment, however, generally proved ineffective. 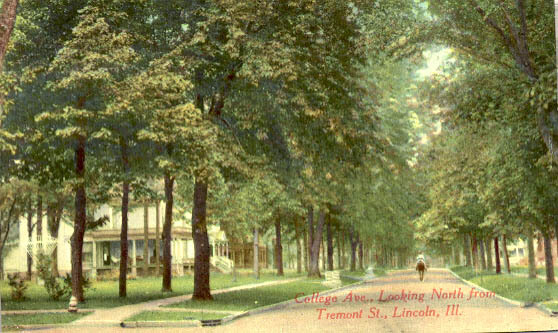 From the early 1940s to the 1960s, Lincoln's countless elms disappeared. Elm Park, across from the GM&O railroad depot, was left with unsightly stumps that were removed in 1949 by Eagles lodge members (p. 8). 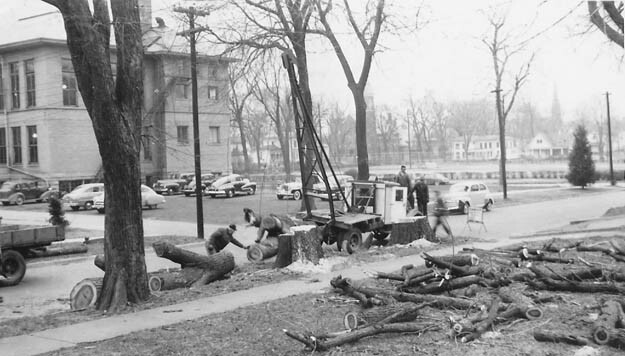 The photo below showing removal of dead elm trees in Lincoln has been provided by J. Richard (JR) Fikuart, LCHS Class of 1965. Respond to J. Richard (JR) Fikuart at jfikuart@hughes.net. Note: The photo shows a piece of machinery improvised by resourceful Lincolnites. The bed of a truck has been equipped with a crane and winch to hoist logs for loading into a nearby truck bed (at left of photo). I see a crew of indeterminate number. Are the men in front of the truck -- one a walking blur -- members of the crew or curious observers? 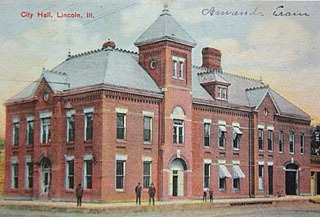 The photo also shows the 1900 yellow-brick Lincoln High School and its parking lot. Beyond the parking lot is the athletic field that was across from the school on Broadway Street. In the center background is the Immanuel Lutheran Church, and at the far right background is the spire of St. Mary's Roman Catholic Church. With the loss of so many shade trees, Lincolnites Carl Hembreiker and Violet Scully were instrumental in beginning effective tree plantings that continue today and have led to the Arbor Day Foundation Award cited above. The recent award symbolizes Lincoln's city fathers and mothers' commitment to continuing a tradition that has helped to distinguish this community. The photo at right further demonstrates the effectiveness of Lincoln's political leaders. Second from the left is former state Senator Robert Madigan of Lincoln, LCHS Class of 1960. He also graduated from Millikin Univeristy. 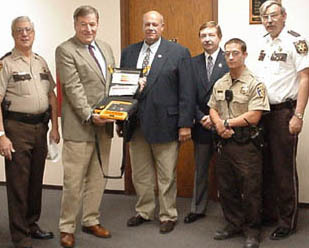 The caption of the photo at right says, "Sen. Bob Madigan was at the Logan County Safety Complex this morning to distribute new portable defibrillators to 45th District sheriff departments. Pictured: Mason County Sheriff Richard Walker, Sen. Bob Madigan, Woodford Sheriff Bill Myers, Tazewell Sheriff Robert M. Huston, DeWitt County Deputy T.H. 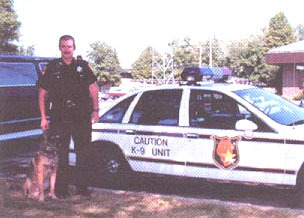 Collins and Logan County Sheriff Tony Soloman." Senator Madigan had a distinguished career in public service that began with his role as city clerk in Lincoln. He entered the Senate in 1987 and resigned in 2001 to serve on the Illinois Industrial Commission. He is now retired. Note to Lincolnites: As a state Senator, Bob Madigan was a key sponsor of legislation in the mid 1990s that gave Illinois public school teachers the opportunity to take early retirement. In 1994, I thus retired from 30 years of teaching English at Pekin Community High School in order to begin a second career teaching technical communication at Southwest Missouri State University (SMSU). My second teaching career created the opportunity for me to teach myself how to design, write, publish, and promote a Web site. At SMSU, where the central mission is promoting public affairs, I got the idea to combine my interests in Web site development and public service. The result is this Web site. Thanks, Bob. · Charitable activity such as "Children Ought to Have Presents at Christmas"
Above text adapted from Chamber of Commerce brochure titled Lincoln/Logan County Illinois. Information is courtesy of www.VillageProfile.com of Elgin, Illinois. 24.15: Name Plate above Garage Doors Reads "City of Lincoln Warehouse"
The above photos were taken by Stan Stringer in the summer of 2002. These photos show the City of Lincoln warehouse, built in 1938 and 1939 by the Work Progress Association (WPA). 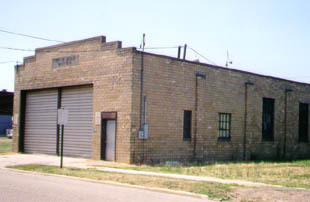 The building is located on Hamilton Street across from the Logan County jail. This is the kind of curious structure that is somewhat transparent to many past and present Lincolnites because we have seen it countless times and have just taken it for granted as part of the scene. Stan writes, "As a kid of 4 and 5, I watched the building being built from the front window of our house on Pekin Street. I liked the color and thought it quite pretty. Regrettably, the tile bricks are beginning to fragment, and so I think this landmark will end up being razed." Respond to Stan Stringer at sstringer@cox.net. 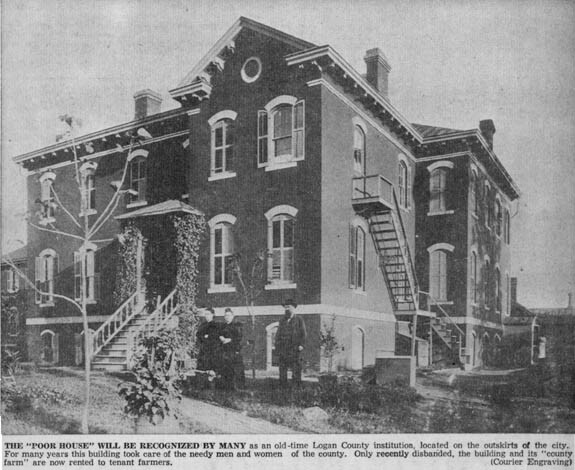 Before the facility pictured below was constructed in 1910, postal services were housed in various buildings in the courthouse square area. 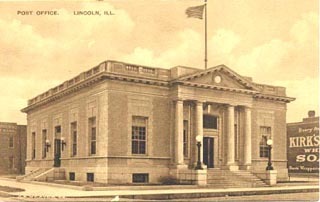 According to Stringer, Congress in 1907 appropriated $75,000 for a post office building in Lincoln. "As a site for the new post office, the government on Nov. 7, 1907, closed a deal for what was known as the Sheer corner, cornering on Broadway and McLean Streets. The work of excavation for the building began in the spring of 1910. 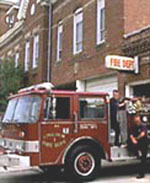 The building is a one story structure with a large basement, fronts 65 feet on McLean street and 80 feet on Broadway" (p. 583). To honor Lincolnite Edward R. Madigan, former Congressman and Secretary of Agriculture under President George Herbert Walker Bush, Congress passed legislation on July 9, 1996, to designate this post office as the "Edward Madigan Post Office Building" (Federal Register Internet Library Services Web site address in Sources Cited). 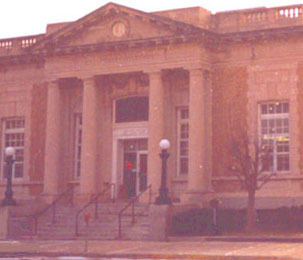 All of Chapter 10 of Time Will Darken It takes place on the Lincoln Post Office steps. There, Nora Potter encounters Attorney Austin King as he emerges from "the revolving door." She prolongs their conversation because she is in love with him, although he is married. "Though he was glad to see her now, if he had had a chance to choose where they met, it would not have been in so public a place as the steps of the post office." Several people he knows pass by, and he suggests they talk in his office. She says in his office she would "just rattle on and on," but that is exactly what she does on the steps. She had begun the conversation by denying her love for him, but then drifts into a rambling account about "how wonderful you are." She even begins to describe in detail a dream she had of him the night before. Austin stands quietly listening: "his eyes rigidly on her face, he heard very little of it." He was hoping she would realize he had work to do. Mrs. Jouette's "shiny black surrey" stops in front of the post office. She asks "the sad-faced girl [sitting] beside her" who is standing on the steps and is told it is Austin King. Mrs. Jouette says in disbelief, "It can't be," but is assured it is. "Seeing the old lady's lorgnette trained upon him, Austin lifted his hat and bowed. The bow was returned, but without any accompanying smile of pleasure, and old Mrs. Jouette turned her attention to the courthouse lawn" [across the street in the opposite direction] (pp. 208-213). "With their hats on and their shoes pushed off under the card table, their voices rising higher and higher, their short-range view of human events becoming crueler and more malicious as they doubled and redoubled one another's bids, made grand slams, and quarreled over the scoring. No reputation was safe with them, and only by being present every time could they hope to preserve their own. The innocent were thrown to the wolves, the kind made fun of, the old stripped of the dignity that belonged to their years. . . . They say was the phrase invariably used when a good name was about to be auctioned off the block. They say that before Dr. Seymour married her she was running around with. . . .," etc. (p. 248). "By December the historians had gathered together all the relevant facts about Austin King's young cousin from Mississippi, knew that she was madly in love with him, and were not surprised when he took her into his office" [to study law] (p. 249). "When they met as a group, they slipped all pity off under the table with their too-tight shoes, and became destroyers, enemies of society and of their neighbours, bent on finding out what went on behind the blinds that were drawn to the window-sill" (p. 249). This passage shows explicit, even harsh, satire -- curiously untypical of its author, who is often described as sympathetic to his characters. To what extent will the historians' work affect Nora, Austin, and their families? All of Maxwell's novels are worthy of being made into film, but none have been. The author was opposed to his novels being made into movies. So, the alternative is to read them, and your local library probably has some. Or, buy them at www.amazon.com and www.barnesandnoble.com. I was amazed and delighted when I found the picture postcard above. 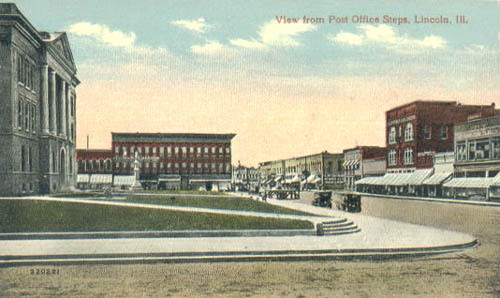 It shows, by a happy coincidence, a view very similar to that Austin would have had of the courthouse square as he stood on the post office steps and looked past Nora. The cars in the photo suggest the scene is from just a few years after the scene in the novel in which horses and buggies are mentioned. Time Will Darken It is set in 1912; the above scene is apparently later in the 1910s. The three-story, red-brick Gillett Building appears in the center background. 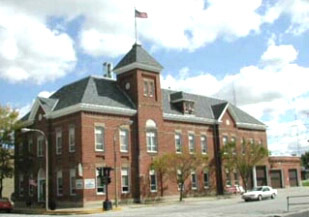 In September of 2002, the State of Illinois closed the Lincoln Developmental Center, and this loss was a shock to Lincoln and all of Logan County. Perhaps this closing shows less willingness of American society to finance social services or perhaps it shows that social change involves finding new ways to meet the needs of special groups of people who are less fortunate than most or perhaps it is both. One of the social services whose responsibility traditionally fell to county governments was taking care of destitute people. 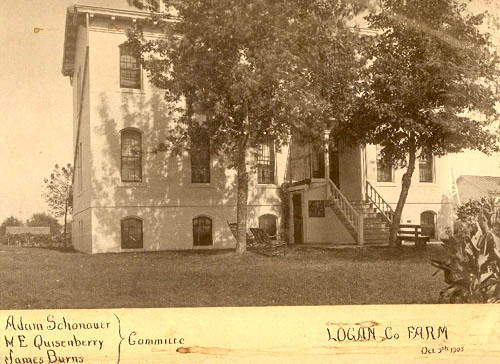 These institutions were called "poor houses" or "poor farms," and Logan County had one, as the following photos show. Fred Blanford first called our attention to this institution, as he sent two photos and text. I present the photo below before the two photos and text supplied by Fred because I believe the first photo predates the others. Shooting in the dark here. Logan County still owns some farm ground that is commonly referred to as the "County Farm." My recollections of the thing do not include any buildings. If I had to use a shorthand phrase to denote how my fuzzy memory recalls just what it was -- I would probably call it the "Poor House." To make clear a point another had confused when I was discussing this with them -- this is not the "farm" that was a part of LSS&C. If I am not mistaken, this [poor farm] is down the road (West) of the Scully Home out North of town. attached [24.22] I have characterized as the "Main Building" which may or may not have held administrative offices, kitchen, and dining hall. If you have never heard of the County Farm -- that indicates good fortune for you -- as those who have may have had relatives that once needed the service it existed to provide. As recent news has advised all of us, there are still places in the world where potable water is not as near as the kitchen tap and dinner is more problematic than just deciding what and how soon. This "farm" was what they today call "infrastructure" for providing for those in need. Should Leigh decide to include some information in his soon to be opened site, I will see that he is provided further and more authoritative information on this subject. I may or may not send along other crops from the larger photo -- partially dependent on whether Leigh is interested in further info. 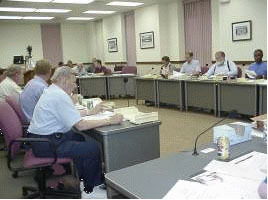 The pic attached is from the center portion of a panoramic photo that is displayed in the Logan County Treasurer's Office. Mary Ellen Bruns (the Treasurer) was kind enough to allow me to scan the photo. It was provided to the County courtesy of Betty Verderber (I believe), and my understanding is she or someone who helped see to its display is relative to one of the Committee Members (James Burns) listed on the matting for the photo. I recently found a postcard that was dear in my memory. Whether or not I email it soon may depend on how soon the "thunderbumper" that roused me this morning allows me to resume my night's sleep. A little more information/speculation to go along with another segment of the panoramic picture of the County Farm. The caption on the matting indicates the picture was taken in 1905. From other information I have gathered, the Committee Member listed on the caption, James Burns, was also a County Board Member on or about that time. The caption further identifies Edward F. Spellman (not our former modern-times mayor Edward L. Spellman) as the "Supt." In my (probably I could safely say "our") lifetime(s) I have seen residential housing "progress" (?) 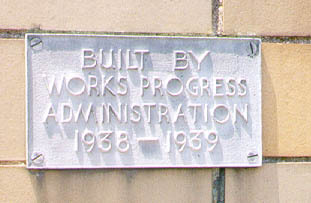 through the post WWII "built to govt. specs. -- VA financed" minimalist abodes -- on to the urban sprawl "3 bdrm ranch" -- to the current seemingly outsized homes in modern developments. Even by current standards, the building pictured in the first crop is very large. Much larger than the "four up/four down" larger homes of the time -- it was a substantially built brick two and a half stories. Rather bodacious for a farmer. The crop attached will show a portion of the main building on the right to help visualize the cluster of buildings that made up the farm. While not quite as clear, the right wall of this building gives me the impression of being another brick structure. A two story building with basement -- it would appear to be unnecessary for operation of an ordinary farm. I have opined it may have been residential quarters for the participants. It is the mid-sized building of the three two story structures that make up this cluster. I am told the rental from the tenant that currently farms the ground for the landlord/county -- goes into the county aviation fund -- or whatever takes care of airport expenses -- with aid of the sort provided then -- now being provided by federal/state government grants and individual donations. A remarkably similar structure (today some refer to these as "cookie cutter" buildings done for the govt. and to govt. specs.) exists in Menard County and is on ground formerly constituted as their County Farm. Additionally -- a relative of the informant had "gone there" to reside in her later years (after that one had been converted for nursing home use) and had indeed lamented "going to the poor house." That structure apparently still exists today although other uses have been found for it -- believed to be sometimes used as housing for "Summer Stock" actors employed at the nearby New Salem for their summer presentations. I am reliably informed (at least the main building) still existed down to relatively recent times. One source recalls seeing it while on "road trips." I might discount this report because of the beer consumed on these trips and the age of the tripees -- but a further source has informed me of the identity of the last tenant (definitely not an aid case -- they were farming the ground and occupying the building -- a common practice in Logan County) and I will rely on Linda Barrick to get further information on this aspect from her co-worker. I appreciate hearing from all. The anecdotes add to the lore -- as I know it, but I believe there may be a wider audience that would also appreciate the individual remembrances. I would encourage responders to address their comments to "all." I would liken my experience with recollections to an item I purchased for our kid many years ago. It was called the Mouse Trap Game or some such thing. In any case, you started a ball rolling and it would "trip" subsequent actions/reactions in a rather Rube Goldberg sort of progression. One remembrance uttered may well "trip" another in others -- and on and on. Again --feedback -- I am informed one participant tried to respond "to all" and had the mailing refused by her server for "too many addressees." I am also aware that some servers (or programs) don't accept the initial mailings -- deemed "not business mail." I suspect these are "anti-spam" efforts in some instances -- and applaud same. However -- I do correspond with many on the "master list" on a one-to-one or one-to-some basis -- and suspect that you folks do too. Having trouble with responding to all -- then select a few you are closer with -- and respond to those only. This is an "opt-in" group. Folks don't want your email or mine -- they can fix it. As for all the others -- some are shy -- some may think (mistakenly so) their remembrances are not relevant or that they are wrong or weird or who knows. Pass on your thoughts or remembrances -- and let the recipients sort it out. I think Leigh is trying to put together a "community" of folks from Lincoln that like to chat about . . . I just deleted a line and half of what I can only describe as "stream of consciousness" words. How do you succinctly describe a chat? I will leave it at that. "My aunt and uncle were Sam and Ethel Hasenmyer. They were administrators of the County Farm when I was about 12 years old. I spent a lot of time there as a kid. The grounds were beautiful. There was a long lane leading up to the main grounds. The grass was kept well manicured, and the white fences on either side were kept painted. The farm was huge. They still had work horses, and I loved to watch them. The main house was where my aunt and uncle lived. The two upper rooms were for the family. None of the residents lived there. They lived in the other two houses. They usually had only one room. The men who worked the farm with my uncle ate in the basement of the main house. There was a huge kitchen, and I helped serve one day. When you went in the side door of the main house, you had about two or three steps to go down, and then you were in a huge kitchen. There were huge stoves and sinks and always someone washing dishes. Going right thru the kitchen was a large room with a large table for the men who came in. To the left was the serving area, with serving windows. The men came thru and picked up their food. I was scared to death of all these old men. (I faintly recall having to take an elevator up to the third floor, but some in my family said I was imaging it.) We would take meals to the residents who could not come to the dining hall. In the summer of 1941 or '42, we had a picnic in honor of the graduation of my cousin from the Air Force Academy. It was held at the County Farm. My cousin and I hid in the grass at the end of the lane waiting for him to come. We had a huge gathering of family that day. Good memories." Respond to Mary L. Wilson at mlw1930@verizon.net. Gehlbach, Nancy Lawrence. "Pity Our Beautiful Trees." Our Times, vol. 7, issue 1, spring, 2002. Gleason, Paul. Lincoln, Illinois: A Pictorial History. St. Louis, MO: G. Bradley Publishing Co., 1998. Material from Mr. Gleason's books is copyrighted with all rights reserved. Mr. Gleason's material used in this Web site is with permission from the G. Bradley Publishing Company, 461 Des Peres Road, St. Louis, MO 63131. Call 1-800-966-5120 to inquire about purchasing Lincoln, Illinois: A Pictorial History (1998) (200 pages of rare photos and text) or Logan County Pictorial History (2000) (also 200 pages of rare photos and text). Please visit http://gbradleypublishing.com/. Lincoln/Logan County Chamber of Commerce Community Profile and Membership Directory. No date or place of publication. Photo and textual information courtesy of Village Profile.com, Inc., 33 N. Geneva Street, Elgin, IL 60120. Please visit the Web site of this remarkable company at http://www.villageprofile.com. books are available at www.amazon.com and www.barnesandnoble.com. Stringer, Lawrence B. History of Logan County Illinois (1911). Reprinted by UNIGRAPHIC, INC., Evansville, IN: 1978.